Today will wrap up the Autumn Jubilee event, but read to the end for a sneak preview of the next big Mystery! I have loved seeing all the progress photos on Flicker. The colors chosen and the projects made are just wonderful. Once again, I’d like to thank all my favorite companies for their participation in providing giveaways for readers. 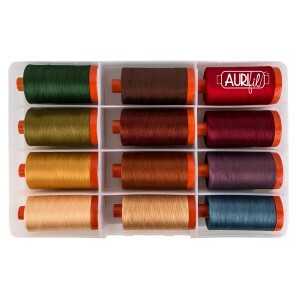 Aurifil winner Nancy at Joy For Grace blog, new follower using a blog reader. Connecting Threads winner of the mini quilt stand and topper is Vicki H, blog reader subscriber. The winner of the Fat Quarter Shop $25 gift certificate is Danice G, email subscriber. Back Side Fabrics $30 gift certificate winner is Val at Val’s Quilting Studio, blog reader subscriber. 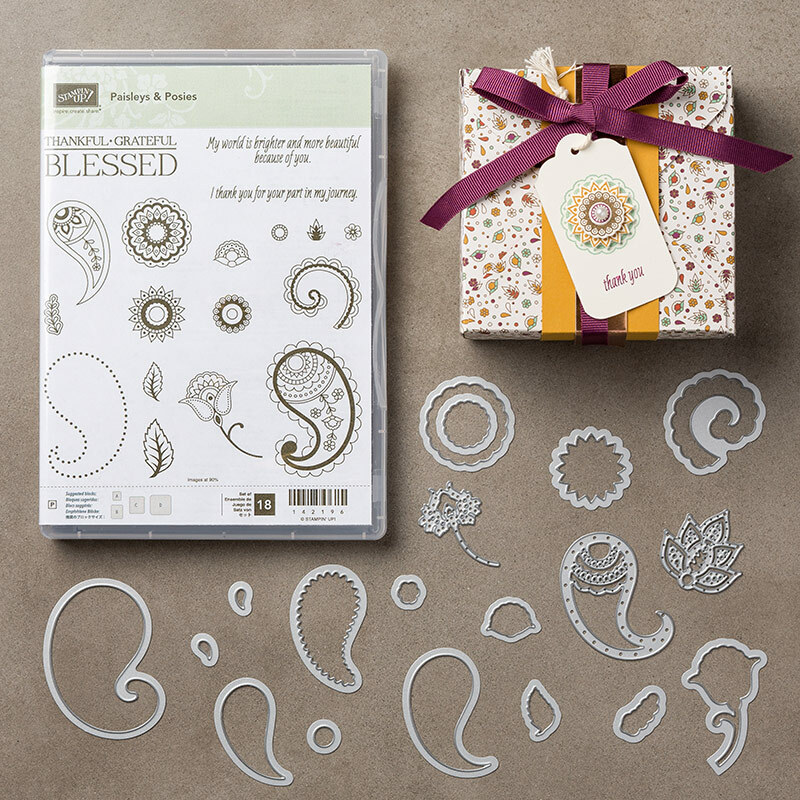 Stampin Up Paisleys and Posies bundle winner is Margaret N, email subscriber. Magnet King – winners of the craft kits are Mary C and Pat T.
From My Carolina Home – The random number generator gave me this picture on our Autumn Jubilee Flickr group, quilting winner – Diann B! Diann may have finished this mini-quilt, but she wins quilting of a table topper. Congratulations to all the winners!! Yes, there will be more events like this one next year. Now, for the preview! I have been sewing like crazy on next year’s mystery quilt. The design is done, one throw size quilt top is pieced, and at the moment it is on the quilting frame. I do like the design, and I think it is a good scrappy look. I am planning to make another larger one to check the measurements. The sneak preview is this – the design will take advantage of jelly roll strips, charm packs and layer cakes, along with some fat quarters. So, take advantage of the clearance sales on those precuts and you’ll have a big head start on the mystery. I just ordered three clearance charm packs for the 5 inch squares I’ll need for the larger size, and save cutting time. I have another new design coming up next week using jelly roll leftovers. It will be a very fast project using just 9 jelly roll strips, so dig out those strips, or cut some WOF strips 2-1/2 inches in width to quilt along with a project that can be finished in an afternoon. Plus, the red two tone quilt is in the design process and I think will be a quilt along too. Did you have fun with Autumn Jubilee? Please join me in thanking all the wonderful sponsors of this event. Love seeing all you do! You are such an incredible, creative lady!!!! Always enjoy your blog. The jelly roll leftovers sounds great, I have lots. Congratulations to all the winners!!! Thanks so much to all the wonderful sponsors of the giveaways!! You are awesome. Special thanks to Carole for putting on the quilt-a-long. I had a great time!!! *Thank you! * for all you do, Carole!! You are SO creative!… It’s always fun to see what you are doing!! I enjoy all your posts. Thank you for sharing. I hope the sponsors realize how great it is to your followers to have prizes at the end of a fun blog project! No matter what, I make note of the companies and shops that support my favorite blogs as they are supporting ALL of us. Your creativity and blog are certainly a reward enough, but the icing on the cupcake is seeing winners delight in prizes. Congratulations to all the winners! Thank you to all the sponsors for their generosity. I appreciate all the work you did in creating these projects and running the Autumn Jubilee. It was fun to follow along and see the work others did. Smaller projects fit into my busy fall schedule giving me some fun things to make in a short time. I first want to congratulate all the winners!! Thanks so much to all the awesome sponsors for their very generous giveaways and a special thank you to Carole, for sponsoring this quilt-a-long, my very first one and I had a ball. I loved seeing what others did on Flickr and although I haven’t completely finished my final project, I’ll leave a picture there as well today. Thanks to all!!! Congratulations to all and a big thank you to all of the great donors! Good Morning Carole! Congratulations to all of the winners! I am looking forward to your next adventure and definitely plan on participating. Deanna is coming over later on and we shall chose our jelly roll strips then. Thank you for all that you do and share. Plus a big thank you to all of your sponsers! Have a fantastic creative day! Thank you Carole so much for this, lots behind the blog posts, and arranging sponsors. Congrats to all the winners, and at last I had time to visit Flicker and see more of those wonderful leaves and pumpkins.Super fabric choices, great arrangements, wonderful photos. My topper has to wait for more batik. And I am looking forward to what comes next. Congrats to all sponsors for making this a fun project. I am almost finished with my table runner with pumpkins and leaves. It has been enjoyable seeing pictures of different projects. Looking forward to all these quilt-alongs! Thank you so much for doing them. Carole this was such a fun event to watch and I love the candle mat I made. I ALWAYS learn so much from your blog and so appreciate the time you took to share all this and organize such wonderful sponsors. I was sooo surprised and so very excited to have won the gift certificate to Back Side Fabrics!!!! THANK YOU for a fun October! Thanks, again, for your wonderful generosity! I have enjoyed participating, and just finished up my penny rug and posted it in the flickr group. I’m going to keep making more maple leaves and maybe they will grow into a table runner or even larger! Congratulations to the winners of those great prizes. That was a fun month. Looking forward to what’s next up your sleeve. Congratulations to all the winners! My friend Vicky & I were at a “sit & sew” this week & on Friday morning she asked if I had read your Friday post. I pulled it up on my phone and we both read it together! (Looking to see if we were winners of course). We did this while I stood at the cutting table trimming my HST for more leaves. 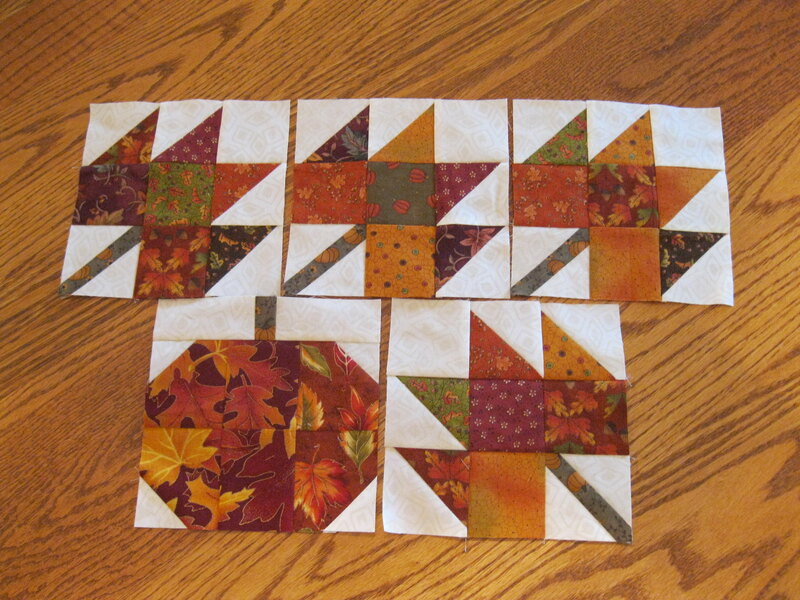 I’ve got lots of leaves and pumpkins made….3 table runners will be my goal. More on my blog later! Congratulations to all the winners and thank you for the tutorial and yours sponsors! This was a fun series to read, thanks for doing this.